Together, the top 10 communication service providers (CSPs) accounted for 500 million IoT (cellular M2M and licensed spectrum LPWAN) connections at the end of 2017. This select group of CSPs has been successful in part due to their scale, with most offering a global, robust and reliable horizontal platform and connectivity play that provides volume based success. A second key factor is their ability to pick the right IoT verticals to target with end-to-end solutions. While the automotive sector remains important for CSPs, in 2017, the verticals which yielded the most CSP IoT contracts were smart cities, fleet and logistics, and asset tracking. Going forward, we also expect to see an increased interest in industrial IoT, both because of the clear cost-benefit case and also due to its potential to drive forward 5G use cases. The IoT/M2M connectivity market is dominated by 10 key connectivity players who have been consistent market leaders over recent years, as shown in Figure 1. Scale matters, and the leaders are operators in large geographic markets such as China and the U.S. (operators from these markets account for five of the world’s top 10), as well as operator groups covering multiple territories (who make up the other half of the top 10). 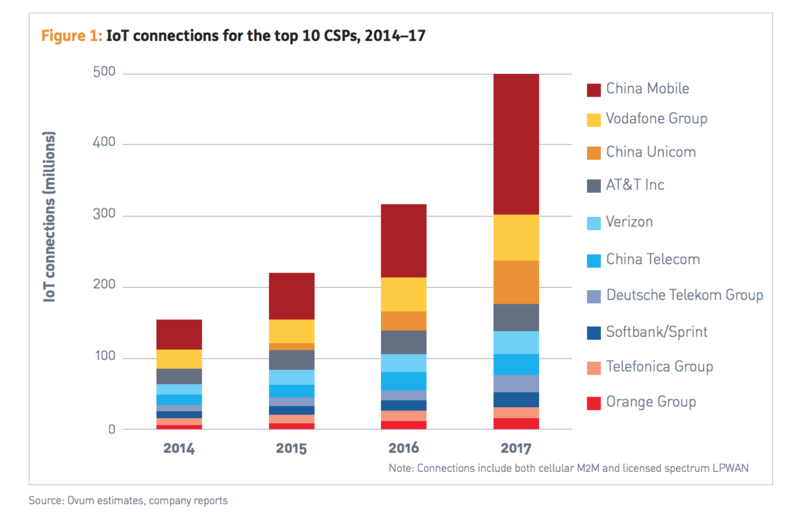 The three Chinese operators (China Mobile, China Unicom, and China Telecom), together with Vodafone and AT&T, lead the pack. 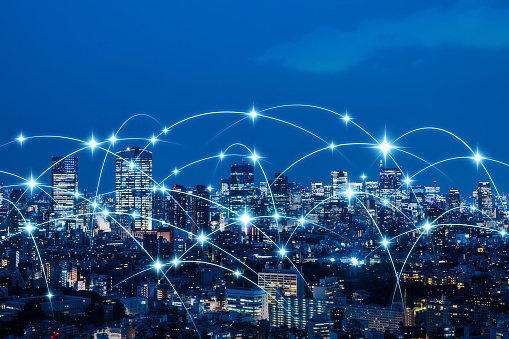 Most telcos are using still cellular M2M technology to connect the majority of their IoT devices. However, as more and more CSPs rollout licensed spectrum LPWA networks (NB-IoT and LTE-M), we are increasingly seeing operators move to reporting combined “IoT connections” as a metric, which generally includes both cellular M2M and LPWAN technologies. For most operators, LPWAN still does not have a significant impact on reported totals, as commercial rollouts are still in these early stages. The exception to this is China, which has seen rapid growth of NB-IoT network deployments over the past 12 months. While NB-IoT takeup in China is still small compared to the overall M2M connections base, we estimate that it reached around 10 million connections by the end of 2017, helping to fuel a 120 percent year-on-year IoT connection growth in China. The Chinese government has thrown its weight behind the technology and is targeting 600 million NB-IoT connections by 2020. Going forward, as more and more service providers deploy NB-IoT and LTE-M networks, definitions will become increasingly important in being able to provide ‘apples-to-apples’ comparisons of CSPs’ key IoT metrics. Ovum’s LPWAN Deployment Tracker, which tracks both licensed spectrum and unlicensed spectrum public network announcements, has identified more than 70 new LPWA network launches across the globe in the last year alone, and takeup is expected to be rapid over the coming five-year period. Certain industry verticals are driving growth in telco IoT contracts. Ovum’s IoT Service Provider Contracts Tracker shows that the greatest number of publicly announced IoT contracts for CSPs during 2017 came from a handful of verticals. Smart cities, fleet and logistics, and asset tracking together made up more than 50 percent of announced contracts, as seen in Figure 2. This is a change to the previous year where connected car and smart metering were the second and third largest category, respectively, after fleet and logistics. It is a reflection of the (relative) maturity of the automotive and metering verticals that the number of contracts announced has slowed down in the last 12 months. The rise of smart cities from fifth position in 2016 to the number one vertical for announced service provider contracts last year reflects the increasing interest and investment in this area. Smart cities are providing CSPs with opportunities to move up the value chain and deliver value beyond connectivity (see Ovum’s upcoming research report, Service Provider IoT Strategies for Smart Cities, which explores this in greater detail). 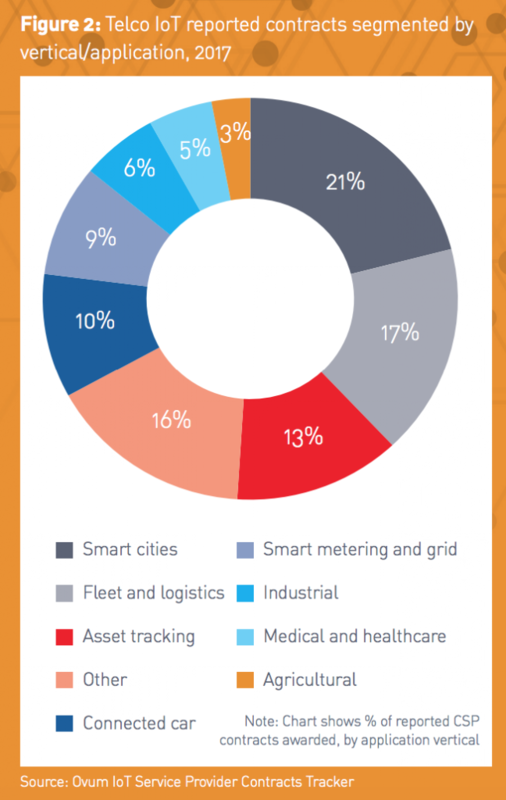 The industrial, medical and health care, and agricultural verticals together made up 14 percent of announced CSP IoT contracts in 2017. The relatively low ranking of these verticals is in part due to telcos coming up against strong vertical-specific players (particularly the case for industrial IoT), and in part due to slower progress in market takeup. The number of telcos offering end-to-end solutions for these verticals is relatively small compared to the larger vertical categories; although there is growing interest in supporting industrial IoT, which is expected to drive a number of 5G use cases. Those service providers that have achieved the greatest IoT success thus far have utilized their scale for horizontal connectivity (and in many cases, platform) plays, alongside of co-creating IoT solutions for specific enterprise use cases in specific verticals. The further a service provider moves away from a pure connectivity and platform offer, the more vertically specific each service layer becomes, and therefore one solution most definitely does not fit all. Most leading CSPs are now narrowing down the number of verticals for which they are developing end-to-end solutions, recognizing the challenges of gaining a deep enough understanding of both buyers and business processes in multiple industries. Vodafone, for instance, has selected a handful of verticals to specialize in (automotive and insurance, and going forward potentially retail and health care), while other providers choose to focus more on smart cities, on retail, or on health care. Typically, CSPs are supporting the development of these vertical specializations through a combination of acquisitions, partnerships and in-house innovation. Even those operators who have the opportunity to provide IoT connectivity at massive scale (e.g., those in China), are still delivering some key end-to-end solutions to maximize their opportunities to drive IoT takeup in specific verticals. For China as well as many other markets, smart metering has been an important focus, particularly so given it is a strong use case for the costs and capabilities of LPWAN/NB-IoT. Water metering projects in Shenzhen and Fuzhou alone have deployed more than 700,000 NB-IoT connections, while a gas metering project in Shenzhen has created a further 100,000 connections. These types of projects are being rolled out across multiple cities. Smart cities have been another key focus for the Chinese operators, and here again the opportunity to deploy at scale makes China an interesting test bed for many smart cities use cases – smart lighting, smart parking, and smart waste being the key smart city applications Ovum is seeing deployed, while a number of private providers are deploying connected bicycles for shared use (e.g., Ofo, Mobike). Many of the government led smart city projects are only just moving into the pilot phase, but takeup is expected to dramatically increase once the value and viability of proof-of-concept initiatives are more widely accepted.